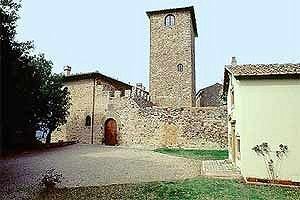 Apartments in medieval castle in the Chianti district, just a few kilometres form Florence. 16/25 sleeping accommodations, swimming pool, rooms for ceremonies and meetings. 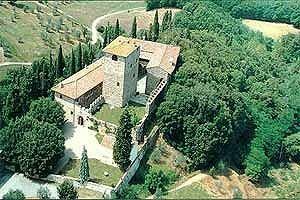 The imposing castle (16+9 sleeping accommodations) stands on a hillside near Strada in Chianti, in the heart of the Florentine Chianti district, from which it dominates a valley covered with olive groves and woods. Florence is 17 kilometres from the estate and all major Tuscan cities of art are within easy car reach. The castle has been declared "Period Residence". The walls and the tower were built in the 10th century, whereas the courtyard, the arcades and the hanging lawn date back to the 13th century. The private chapel was added during the 17th-century renovation and embellishment works. 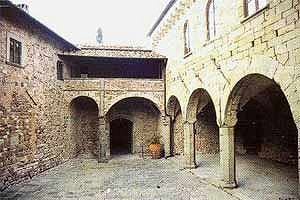 A wing of the castle has been converted into an accommodation facility in the respect of the original monumental value of the building, whereas another wing has been equipped for hosting meetings and ceremonies. 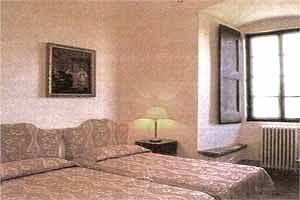 The castle accommodates up to 16+9 people in 8 double bedrooms. Suite IMPERIALE (80 m² - 4+1 sleeping accommodations): is on the ground floor and composes of a large living room, a living/dining room, 2 double bedrooms and 2 bathrooms. Wonderful panorama. Suite VINSANTO (65 m² - 4+1 sleeping accommodations): is on the ground floor and is divided into hallway, 2 double bedrooms and 1 bathroom. 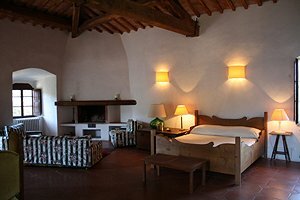 Bedroom GIUGGIOLO (80 m² - 2+2 sleeping accommodations): situated on the first floor, it composes of a bedroom/living room with fireplace and a bathroom. The room is very bright and offers a wonderful vista of the valley. 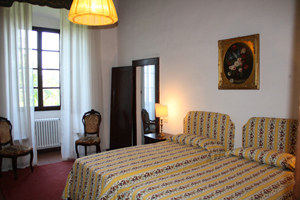 Bedroom TORRE 1 (LECCIO) (55 m² - 2+2 sleeping accommodations): this bright room featuring big windows is on the first floor and is divided into a bedroom/living room and a bathroom. 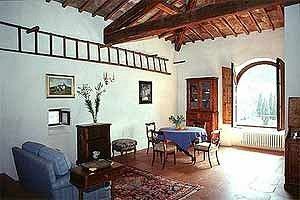 Bedroom TORRE 2 (CAPPERO) (55 m² - 2+1 sleeping accommodations): situated on the second floor, the room is very bright and features an ancient fireplace. It composes of a bedroom/living room and a bathroom. Bedroom TORRE 3 (BELVEDERE) (55 m² - 2+2 sleeping accommodations): situated on the third floor of the tower, the room offers a magnificent panoramic view. A bedroom/living room and a bathroom compose this romantic apartment. 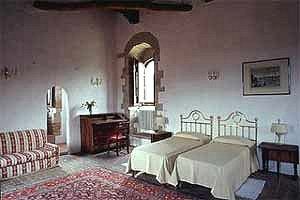 At guests` disposal: the equipped kitchen, the dining room with a big fireplace and the private panoramic swimming pool.